According to President Trump, Democrats and Republicans are already working together on a short-term solution in response to his decision last week to cut off cost-sharing reduction (CSR) payments under Obamacare. "They're right now having emergency meetings to get a short-term fix of healthcare where premiums don't have to double and triple every year like they've been doing under Obamacare. Because Obamacare is finished. It's dead. It's gone," he said at a Cabinet meeting Monday. The CSR payments are subsidies that help lower-income Americans afford health insurance. They're paid by the administration directly to insurers. Mr. Trump was also confident that Republicans would ultimately be able to pass a repeal of Obamacare, and a "long-term fix" to CSRs next year under the budget reconciliation process, despite the fact that GOP lawmakers repeatedly lacked the votes in the Senate for a handful of proposals this year. Late last Thursday, the White House abruptly announced that the Trump administration would halt CSR payments after the Department of Justice and Department of Health and Human Services concluded that there was no appropriation from Congress to fund them. Democrats, and even some Republicans have blasted the move, and attorneys general from nearly 20 states have filed a lawsuit challenging the decision. What exactly are CSR payments? These payments are made by the federal government on a monthly basis to health insurance companies to help reduce deductibles, co-payments and other out-of-pocket costs for lower-income Americans who make below 250 percent of the federal poverty level. The CSR payments go directly to the insurers. The subsidies are different from the Affordable Care Act's tax credits, which can either also go directly to the insurer to reduce monthly premium payments or can go to the consumer who choose to collect the tax credit at the end of the year. A Kaiser Family Foundation analysis from April found that among the more than 12 million people who selected a 2017 Obamacare marketplace health insurance plan, more than 7 million are receiving cost-sharing reductions. Why is the administration cutting them off? The Trump administration concluded that the government can no longer legally make the CSR payments -- even though it had been paying them since the president's inauguration in January -- because Congress didn't approve the appropriation for them. According to estimates, they cost the government $7 billion in fiscal 2017, which ended Sept. 30 and $10 billion in the current fiscal year. "That money is a subsidy for insurance companies," Mr. Trump told reporters Friday, suggesting that it has only helped boost their stocks. "If the Democrats were smart, what they'd do is come and negotiate something where people could really get the kind of health care that they deserve." As a result of a 2014 lawsuit filed by the House of Representatives, a district court judge last year found that the payments were not lawful but the Obama administration was allowed to continue them as they waited for an appeal. Speaker Paul Ryan, R-Wisconsin, said in a statement following Mr. Trump's decision last week that Congress controls the power of the purse. "It was in defense of this foundational principle that the House, under the leadership of former speaker John Boehner, voted in 2014 to challenge the constitutionality of spending by the Obama administration that was never approved by Congress," Ryan said. "The House was validated last year when a federal court ruled that the Obama administration had indeed been making unauthorized and therefore illegal payments through Obamacare." Democrats and patient advocacy groups slammed the president's decision. Democratic leaders Sen. Chuck Schumer of New York and Rep. Nancy Pelosi of California said that it could backfire on the administration. When the premiums go up, they believe, it's Mr. Trump who will take the fall. "Make no mistake about it, Trump will try to blame the Affordable Care Act, but this will fall on his back and he will pay the price for it," the two predicted in a joint statement. Medical groups including the American Psychiatric Association, American Academy of Family Physicians, American College of Physicians, American Osteopathic Association, American Academy of Pediatrics and American Congress of Obstetricians and Gynecologists also oppose the president's move. Nineteen state attorneys general filed a lawsuit Friday challenging the decision. They represent New York, California, Connecticut, Delaware, Illinois, Iowa, Kentucky, Maryland, Massachusetts, Minnesota, New Mexico, North Carolina, Oregon, Pennsylvania, Rhode Island, Vermont, Virginia, Washington and Washington, D.C. They argue in the lawsuit that the federal government is required by law to make the payments and that halting them would be "contrary to the law" and "arbitrary and capricious" in violation of the Administrative Procedure Act, according to New York Attorney General Eric Schneiderman's office. Are there Republicans who are against Trump's move? Yes, Sen. Susan Collins, R-Maine, a moderate, said she opposes the decision. In an interview on CNN's "State of the Union" on Sunday, she said that the president's move is affecting the ability of vulnerable people to receive health care. "This is not a bailout of the insurers," she said. "What this money is used for is to help low-income people afford their deductibles and their co-pays so that their health care is available to them." 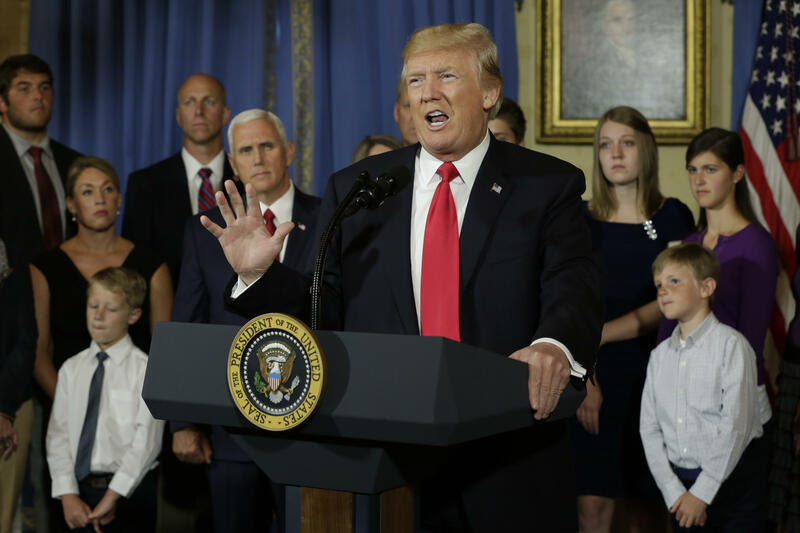 The nonpartisan Congressional Budget Office (CBO) warned that if the president ended the subsidies, premiums would increase by 20 percent for silver plans next year and some people would have no insurers in the nongroup market. And yet, cutting the CSR payments will actually end up costing the federal government more, adding $194 billion more to the debt by 2026, according to the Congressional Budget Office (CBO) and Joint Committee on Taxation. That's because for consumers within a certain income range, the cost of a marketplace health insurance plan cannot cost more than a certain percentage of their income -- so when premiums rise as a result of the elimination of the CSR payment, they will get more tax credits to make up the difference. If Congress doesn't offer a legislative fix soon, the issue could become a sticking point in spending negotiations ahead of a Dec. 8 deadline to fund the government. Democrats made it an issue in April during talks about government funding. Then, too, the president had threatened to cut off the payments. Democrats wanted language wrapped into the appropriations package that would guarantee that the payments would continue. It's unclear if Democrats would be willing to risk a government shutdown over the subsidies.